Trench was specially commissioned by The Lowry, Salford for Paddy Hartley’s mini retrospective staged as part of their ‘Edits’ series of residency/exhibitions. 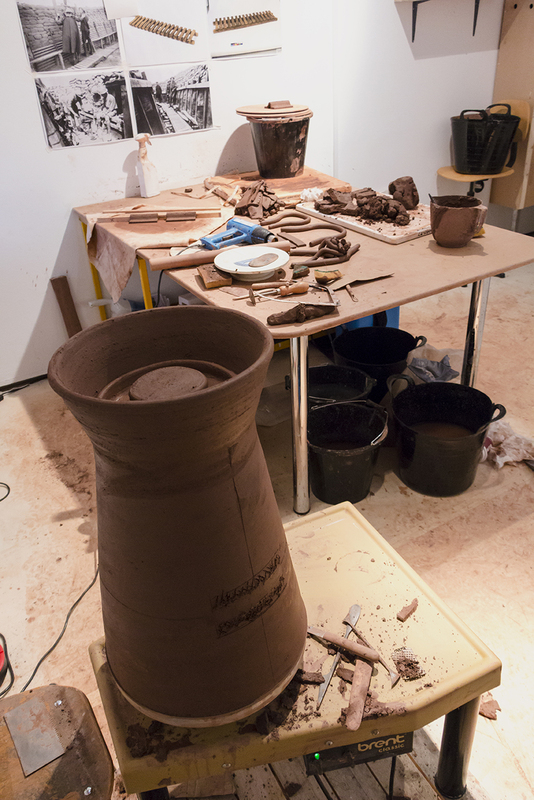 Working with unfired brick clay, Paddy created new work throughout the exhibition in response to WW1 battlefield archeology, excavation legislation, the changing landscape of WW1 battlefield sites and the notion that memories of the conflict fade and pass with those who experienced the conflict. Trench was created as a device to stimulate conversation with visitors to the gallery about notions of Remembrance, how we remember, for whom and why. Visitors were encouraged to share their family stories of WW1 and in particular, share object kept by loved ones on active service as a reminder of home. Objects which survived the war as did the ancestor whose relative shared the story. 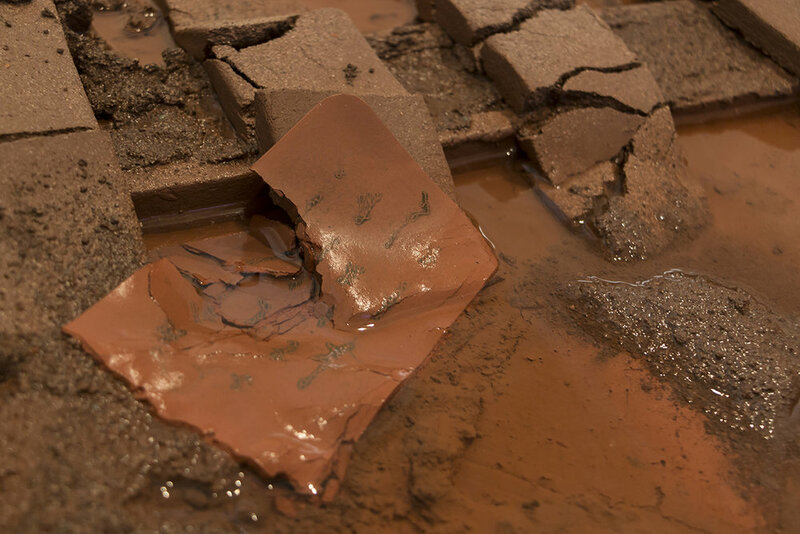 Throughout the exhibition, Paddy created objects in response to these question and personal stories shared by visitors, using brick clay slurry excavated from the in-gallery archeological trench Once created, the work was then placed back in the trench, allowing the work to disintegrate in the moisture laden clay slurry. Creating work which lasts only in the memory of those who saw it and inspired it, acknowledging that memory, all our memories fade and pass. To set the scene and create a sense of location, Paddy recreated duckboards, wooden walkways originally designed to create a floor above drainage on which soldiers could walk. One of the challenges of working with very coarse brick clay was to pick up detail from the wooden slats Paddy used as moulds and textures for the floorboards. 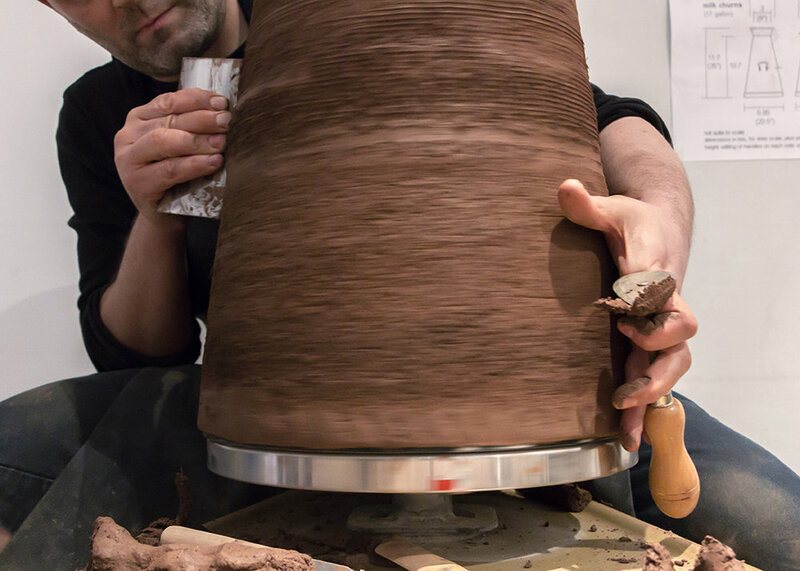 Saturating the surface of the clay which had been previously rolled to the correct thickness, created a superficial slurry which translated the impression of the texture of the wood. 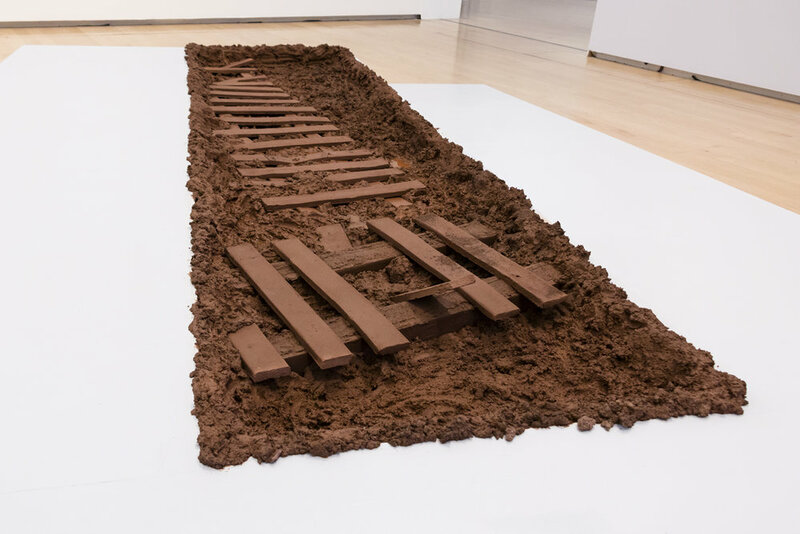 Once assembled in the trench, the piece was heavily saturated to begin the process of disintegration. To create a link between ' Trench' and the accompanying embroidered uniform work on display in the gallery, Paddy revisited the story of one of the men who was subject of this work, William Michael Spreckley. Prior to his pioneering facial reconstructive treatment, Spreckley in pre-war years was living and working in Dresden, learning the trade of industrial lace making in line with his family business back in the UK. Om the outbreak of War, Spreckley’s journey back to the UK was complicated by the fact that his command of the German language was so good, the German authorities though im a young German trying to avoid national service. According to family legend, part of Spreckley’s journey back to the UK was smuggled in and amongst transported 17 gallon milk churns. For ‘Trench’, Paddy recreated the top third of a 17 Gallon milk churn using a combination of coiling, therewith, turning and modelling assembled components, linking this new work with the embroidered work detailing William’s pioneering surgery. For his final two weeks working in gallery at The Lowry, Paddy turned his attention to story shared by a visitor to the exhibition whose Grandfather, a WW1 ambulance driver kept a notebook during his service. The book contained sketches, poems, comments and cartoons drawn by fellow service personnel, patients and colleagues and proved to be a fascinating glimpse into the personalities who contributed to the book. 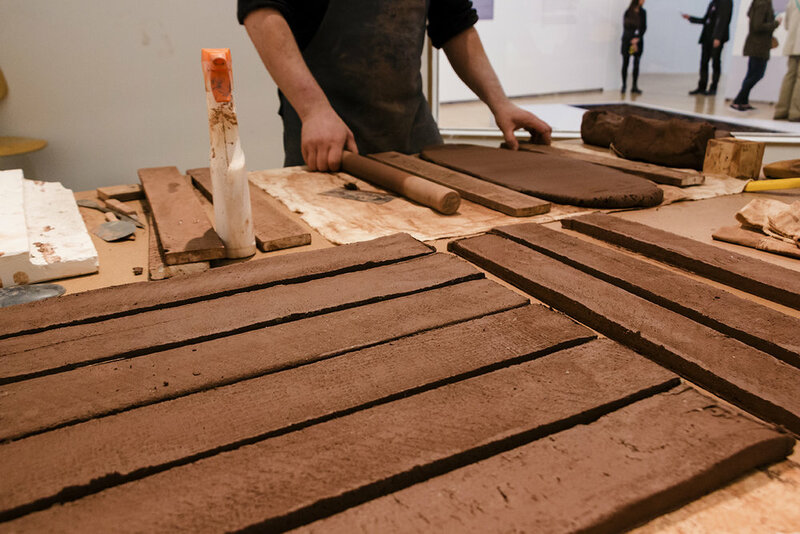 Paddy recreated a series of these pages, translating them to hand carved plaster press moulds and taking impressions with paper thin sheets of porcelain paperclay, loaded with red iron oxide to match the clay in the trench. Black brick clay dust was worked into the plaster print plate before the impression was taken wit the porcelain paperclip sheet. Once dried, these were scattered across heavily saturated ‘Trench’, some of which disintegrated in a matter of minutes. Thanks to our sponsors Michelmersh Brick Holdings PLC and The Thompson Laboratories, King's College London. Thanks to Mr S. Brown for his generous contribution in the making of this work and sharing of his Grandfather's story. Thanks to the family of William Michael Spreckley for their continued generosity and support in telling his story. Please request permission to reproduce content from this website.